Combine two of the best desserts for one epic holiday dessert – Mini Pecan Pie Cheesecakes! Sweet and creamy cheesecakes with the deep, rich flavors of pecan pie filling make these an irresistible bite sized dessert, especially since they are both easy to make and serve! Mini Pecan Pie Cheesecakes Make the Perfect Holiday Dessert Recipe for Thanksgiving or Christmas! 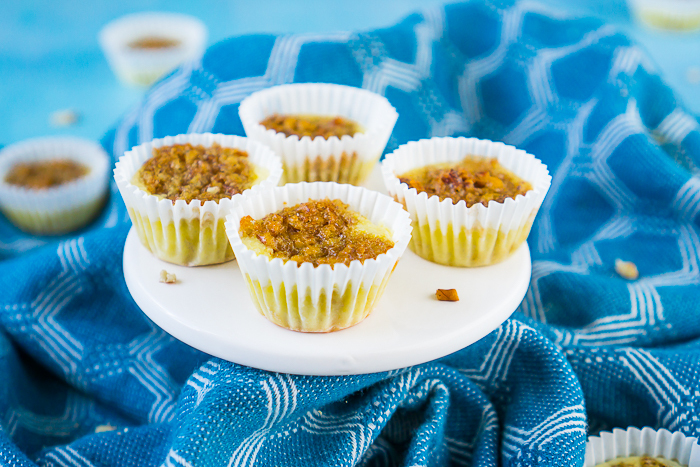 I didn’t think it was going to get much better for me this holiday season then the Pecan Pie Cookie Cups I already shared this month, and then I made these Mini Pecan Pie Cheesecakes! I immediately called my sister and texted my best friend after taking a bite that this was one of the best desserts I’ve baked in a long time. Seriously! Hopefully Bryan’s family agrees as I’m bringing the batch up as Thanksgiving dessert! I’m relatively new to the whole Pecan Pie dessert craze. As much as I grew up using pecans in our baked goods, my mom never once made a pecan pie. It just wasn’t a part of any holiday menu, but I am definitely a convert now. How can I not be? Pecan Pie has a sweet, nutty filling that’s almost caramel-y in flavor. It’s heaven! Now, add that amazing pecan pie filling on top of a rich, creamy cheesecake and you have dessert perfection! For these cheesecakes, I decided to use my base mini cheesecake recipe. This is the recipe I’ve been using for decades and my mother decades before that because it requires only 4 ingredients and has never failed me. Something we want in a go-to dessert recipe, right? This easy cheesecake filling is sitting on top of a mini Nilla wafer, which fits perfectly on the bottom of a mini muffin pan cup. 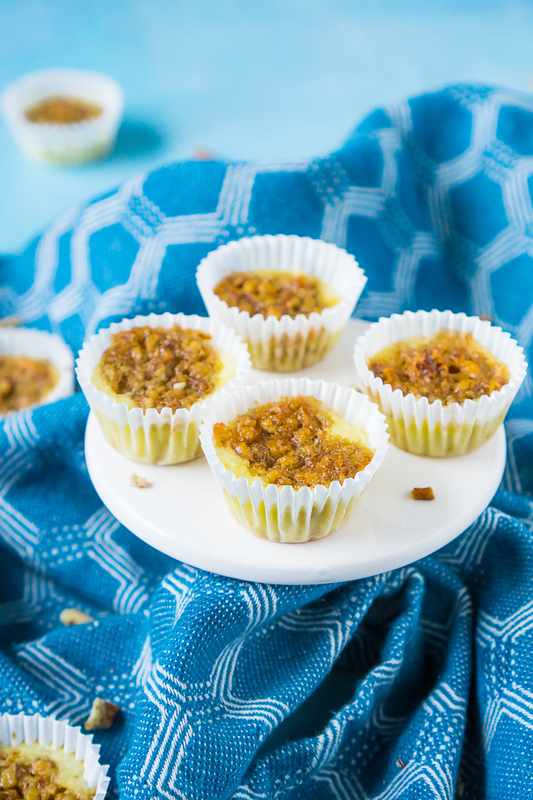 To make these Pecan Pie Cheesecakes, I whipped up a batch of the same pecan pie filling I used in my Pecan Pie Cookie Cups. I like this recipe because you just mix everything together easily where as many recipes require some stove top work or even careful preparation to avoid eggs from cooking in the baking process. This pecan pie filling is easily just mixed together and then added on top of the cheesecake filling. The cheesecake filling and the pecan pie filling bake together, with the pecan pie portion remaining on top for a beautiful brown pecan color that also makes them easily identifiable on a party dessert table! LOOKING FOR A PECAN PIE CHEESECAKE WITH GRAHAM CRACKER CRUST? To make the graham cracker crust: Stir together the graham cracker crumbs, brown sugar, and the melted butter. Press about 2 tablespoons of the mixture into the bottom of each muffin liner and press to compact. Done! You might also love my recipe for Pecan Pie French Toast Bake! It makes a great holiday breakfast! Mini Muffin Pan <— I love this one because it is 48 mini cups on one pan! Perfect for mini cheesecakes! Hand Mixer <— This one comes with built in storage for the whisks and accessories which is awesome! 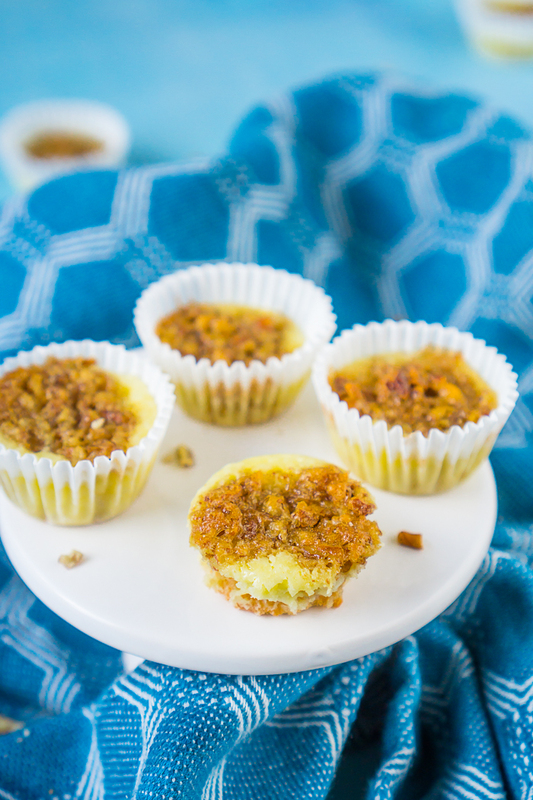 Combine two of the best desserts for one epic holiday dessert - Mini Pecan Pie Cheesecakes! Sweet and creamy cheesecakes with the deep, rich flavors of pecan pie filling make these an irresistible bite sized dessert. Line your mini cheesecake pans with liners and place one mini nilla wafer at the bottom of each liner. Scoop around a 1/2 tablespoon of cheesecake filling onto each vanilla wafer. In a large bowl, use hand mixer to cream together butter, brown sugar and salt. Stir in corn syrup and vanilla, then add eggs. Add a 1/2 teaspoon of pecan pie filling on top of each cheesecake filling. Bake at 350 degrees F for 12-17 minutes. You want the cheesecakes to be set against a gentle touch - firm but still soft. Cool completely in the fridge and enjoy!